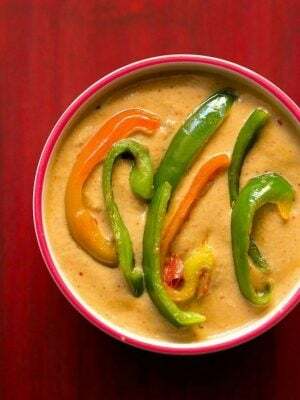 thai veg tofu soup is a soothing, warming and healing thai veg soup to beat the chill in winters. winters are the times for having soups. 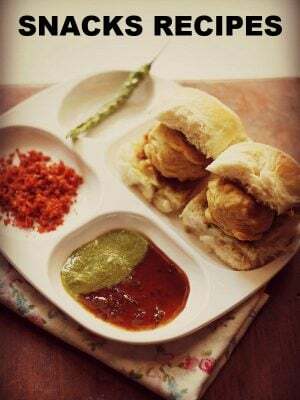 india is witnessing a really chilly winter this year and apart from the heart & belly warming food that we make there are many varieties of soups or shorbas we also make. so there is the fiery & pungent galangal and fragrant lemon grass along with the hot hot red piri piri chilies…. not to mention the soothing basil and lime leaves. 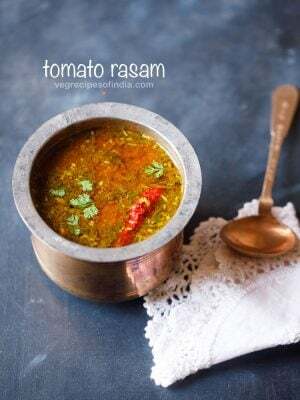 so the ingredients that go in this soup heals you – from the cold ailments experienced in winters. 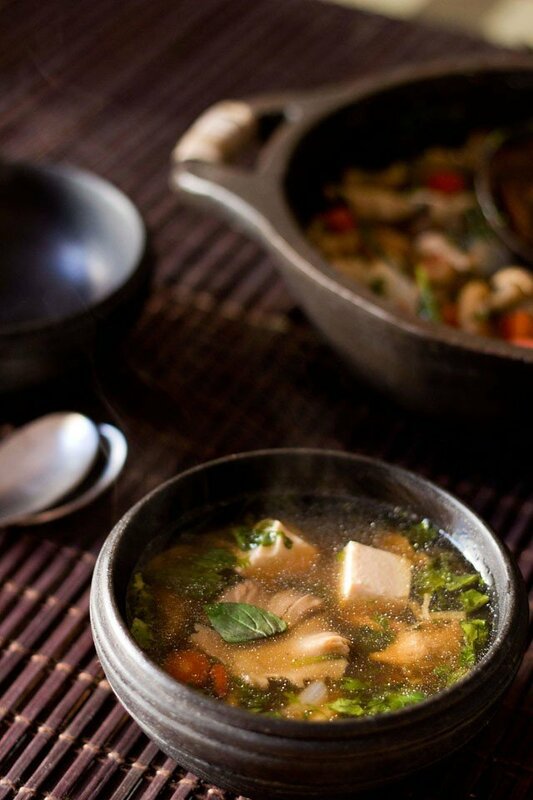 the thai veg tofu soup is warming & comforting for the body as well for the soul. i have used oyster mushrooms in this soup as i did not have fresh mushrooms. 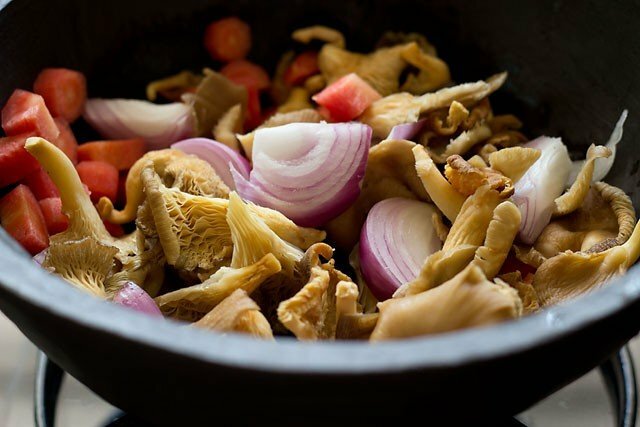 to make the soup you can add a mix of different varieties of mushrooms or even just plain button mushrooms. the vegetables can be of your choice and what is available in season. broccoli, carrots, beans, cauliflower, bok choy, potatoes – any of these veggies can be added. i only had carrots with the mushrooms but still with only two veggies, the soup tasted yummy. i had piri piri chilies, so added them to the soup. but you can add bird’s eye chilies also. again i have added lime leaves from my lime shrub. 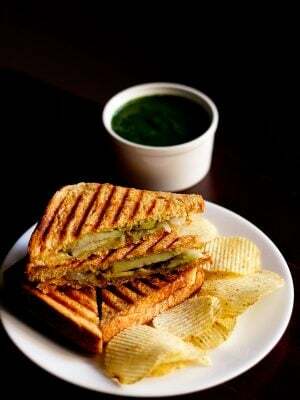 but in absence of lemon leaves or kaffir lime leaves, you can add the zest of a small lime. as far as galangal is concerned, ginger just does not come close to it. so i won’t suggest substituting ginger for galangal. 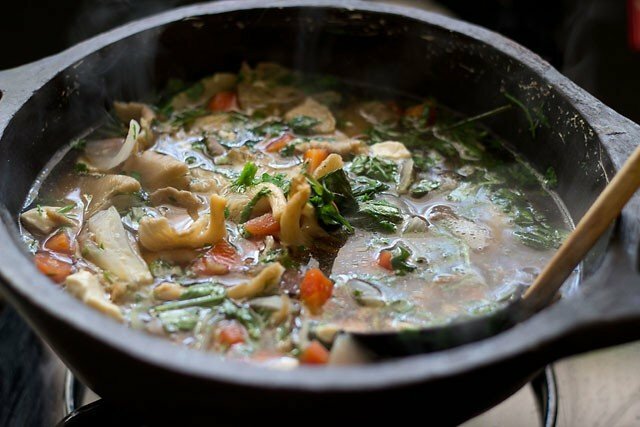 the soup won’t taste or feel authentic if galangal is not added. 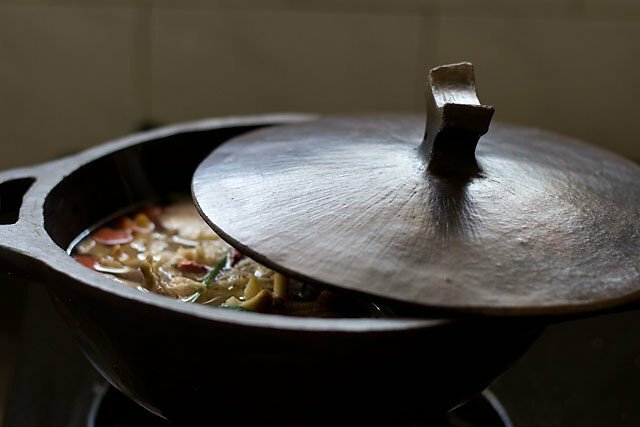 when i was seeing the pics of the soup, they were beautifully captured. i think one of best step by step pics so far. the light was perfect this day and i have not done any post processing on the images, apart from reducing the size. 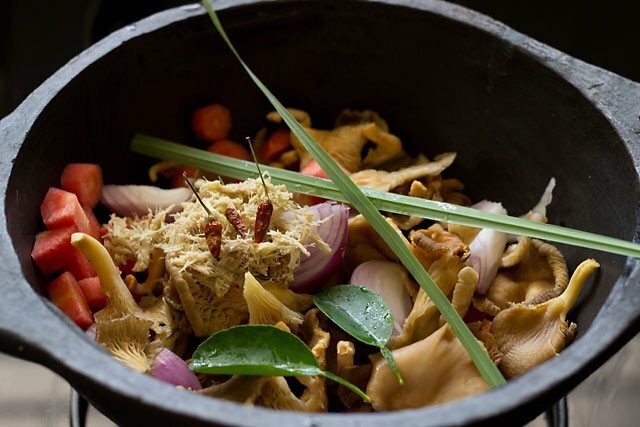 crush the galangal and ginger in a mortar and pestle to a semi coarse or fine paste. take all the veggies, piri piri chilies, lemon grass, lime leaves, curshed galangal-ginger, salt in a pot. add water and keep the pot on a medium flame. cover and let the soup boil first. then lower the flame and let the soup simmer for 10 minutes. meanwhile, in another pan, heat oil. pan fry the tofu for 2-3 minutes stirring often. 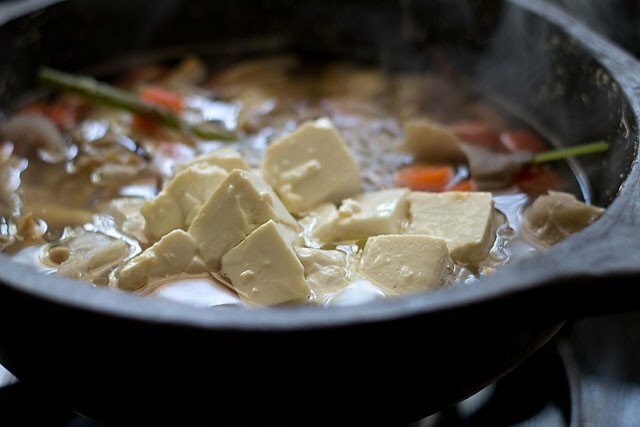 add the tofu with the oil to the simmering soup. simmer for 2-3 minutes, season with black pepper and soy sauce. lastly add the chopped basil & coriander leaves. 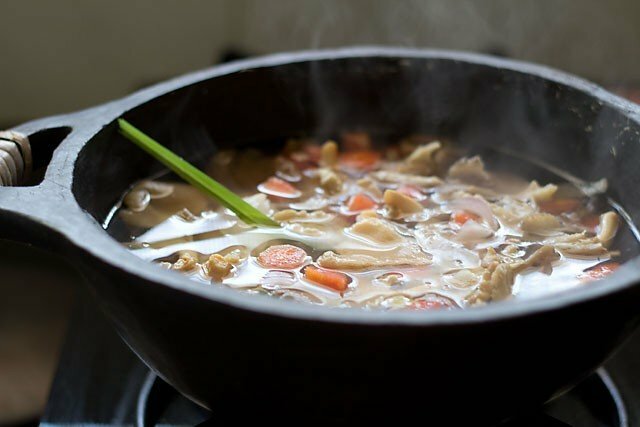 simmer thai tofu soup for a minute. 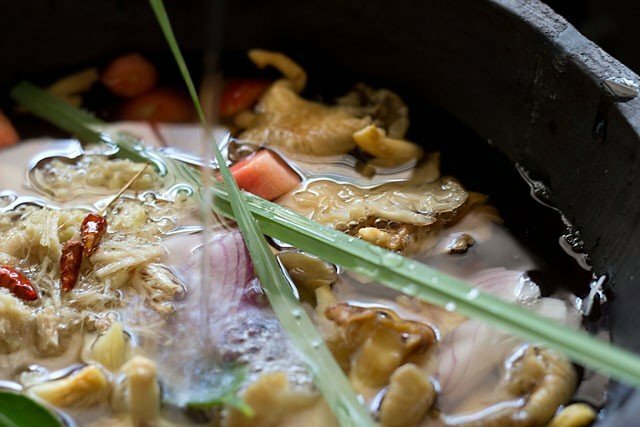 before serving thai tofu soup, remove the piri piri chilies, lime leaves and lemon grass stalks. 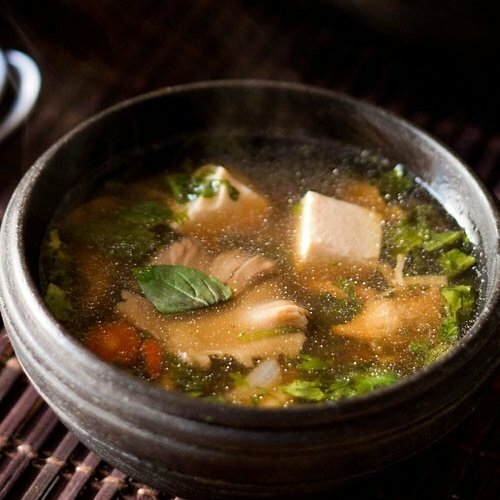 serve thai veg tofu soup hot in soup bowls garnished with some basil leaves. 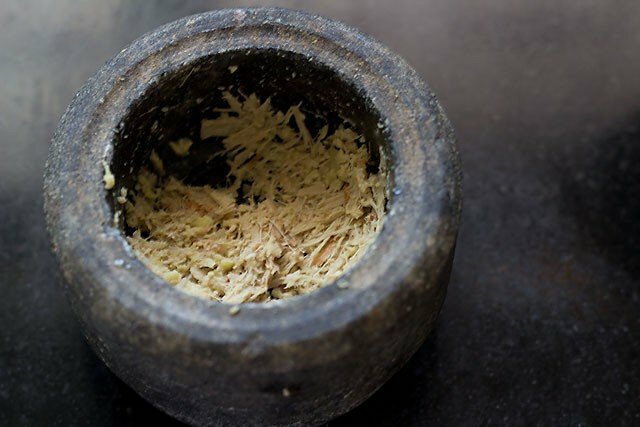 1. if the galangal is fibrous and hard, then make a fine paste. otherwise you may taste the galangal threads when having this thai veg soup. 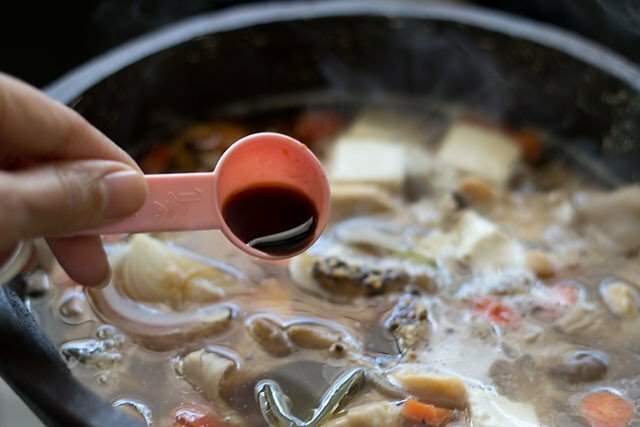 2. the amount of pepper and soy sauce in the soup can be adjusted as per your preference. 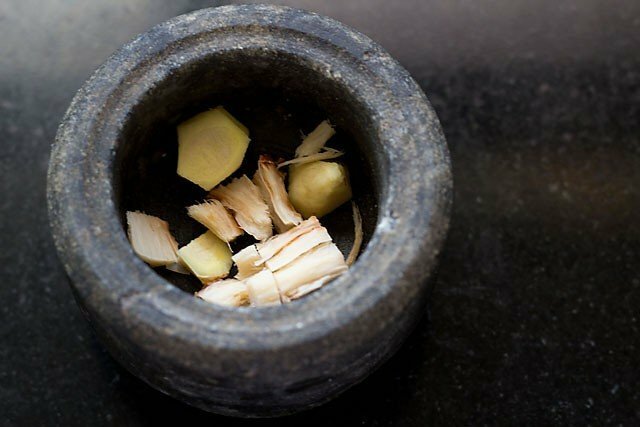 1: in a mortar & pestle take galangal and ginger. the creamish one is galangal and the faint yellowish one is ginger. you can also grind these with a blender. 2: crush both to a semi coarse or fine paste. 3: now take the sliced onions, oyster mushrooms, carrots and whatever veggies you have in a pot. 4: time to add some spice, flavors & aroma – piri piri chilies, lime leaves, lemon grass and the crushed galangal-ginger are added. 6: cover and cook all of them on a medium flame. 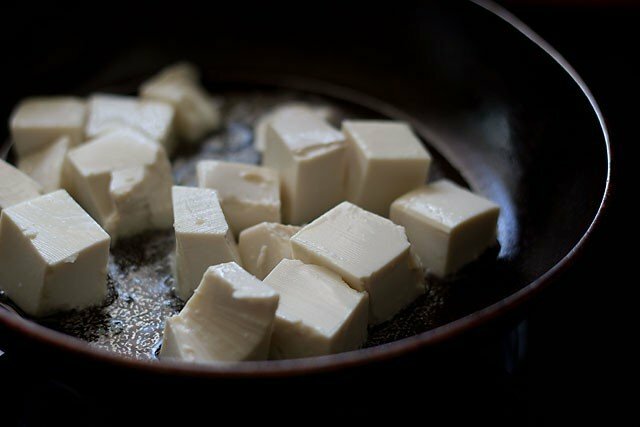 8: meanwhile in another pan, heat some oil and pan fry the silken tofu. 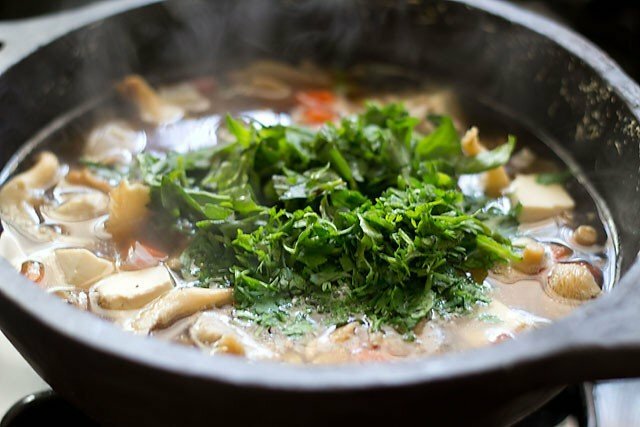 9: add tofu with the oil in the soup pot… stir…..
12: there goes the herbs… basil & coriander leaves. 13: stir and cook for a minute. 14: before serving thai tofu soup, remove the piri piri chilies, lime leaves and lemon grass stalks. 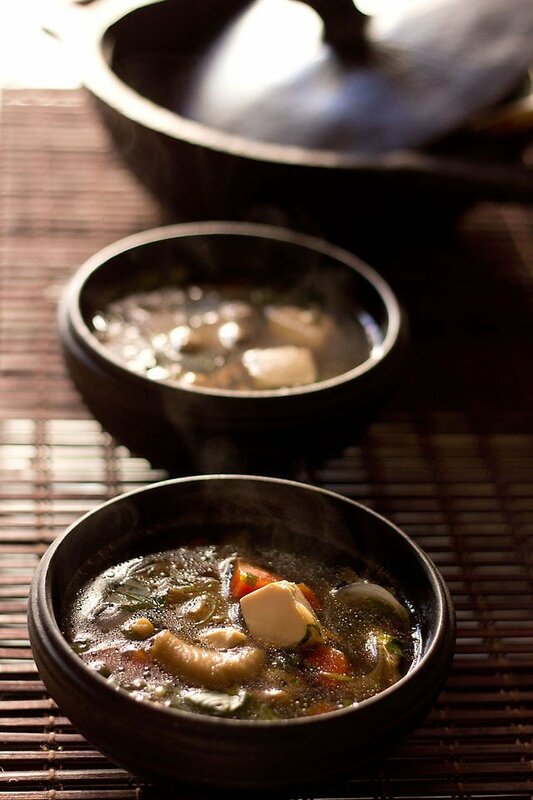 pour the soup in bowls and serve thai veg tofu soup plain or with some warm rice or noodles. Hi. Am yet to try the soup but it looks very delicious. I was wondering if I can avoid the mushrooms or replace them with anything else. thanks. you can skip the mushrooms. Hi Dassana, Made your soup today and it came out great. Loved the varied flavors and scents from the herbs. I used ordinary tofu to make this and it still came out great. However I felt my soup was lacking in one element i.e. sweet. So I added sugar. thanks radhika for the positive feedback and your inputs. glad to know you liked the soup. i bought the soup pot from an handicraft exhibition. its a stone pot from manipur. i have seen this stone pots getting sold in some websites too but don’t remember the website name. frankly speaking, it is overpriced. 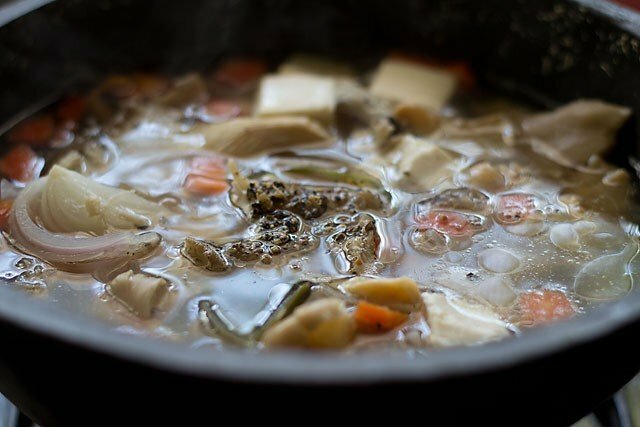 This soup looks great.. Just wondering if I can use vegetable broth instead of water too add even more flavor. you can use veg stock. no one has tried i guess as i have not received any feedback. hi meena, the links are there in the side bars on the blog. also thanks. I’m glad I found your blog! The recipes look amazing. I cook Indian and Thai dishes and love to try new ones and your directions are very nicely broken down. I often make a Thai soup that calls for many of these herbs and spices, but also has fish sauce and other fishy ingredients. But lately I’ve been having more veggies, so this soup will be great! I intend to make it today! Refreshing soup.Was looking for thai soup ,your look appetizing.bookmarked.if i couldnt fresh lime leaves any substitute for it. thanks meena. 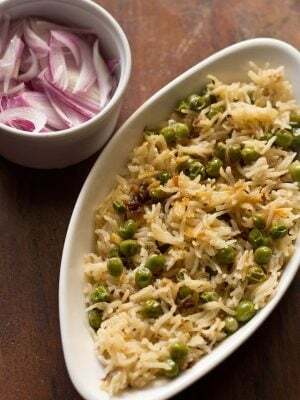 add grated zest (lime rind) of 1 small lime instead of lime leaves. This soup was wonderful!!! We couldn’t find galangal at the store and left out the cilantro (personal preference), but added bean sprouts. A very complex, satisfying recipe! Thank you! your pictorial presentation is amazing..moreover i like the vessel in which you have prepared the soup..any idea where can we get fresh thai herbs? thanks riyas. nowadays you can easily get fresh thai herbs from a gourmet or hypermarket store in indian metros or cities. difficult to get these in towns though. Loved ur step by steps! That thai veg tofu soup looks delicious! The bird’s eye chilies you mentioned above are those common green chillies in the market? I never knew their name, everybody just calls them green chillies. The piri piri chillies are quite hot right? Dassana your soup looks amazing. Often I see tofu in the shop but I never know what to make with it, so I don’t buy it. Plus there are so many different type of tofus that it confuses. the bird’s eye chilie are thai chilies and they are red in color. they are hot indian chilies. piri piri chilies are the tiniest chilies and very hot. i have only seen regular tofu, spiced tofu or the silken tofu. the silken tofu is smooth and melt in the mouth unlike the regular tofu. mori nu brand is the best. they have firm and extra firm silken tofus too. you can make scrambled tofu like scrambled eggs or add them to soups or noodles, pasta and even rice. also they can be batter coated and fried or grilled too. 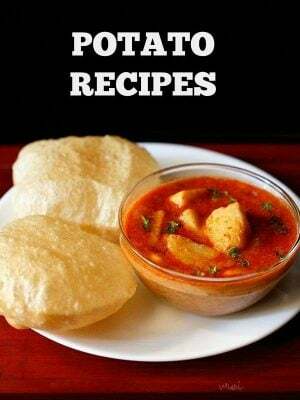 tofu works a substitute for paneer and there are various indian paneer recipes that can be made with tofu. if you can manage to get silken tofu, then do try it. buy the extra firm or firm ones as they are good for stir fries and sauting. I am definately goona try this soup…looks absolutely delicious…..